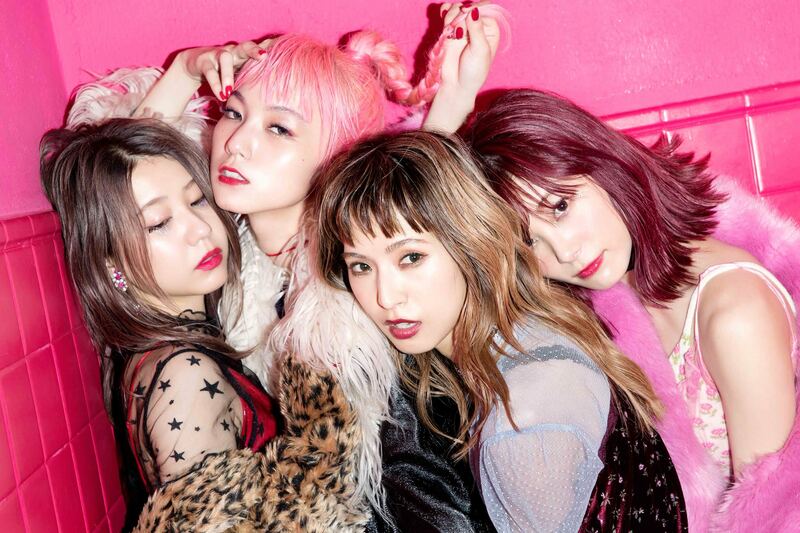 SCANDAL's 8th studio album 「HONEY」 will be released on 2018/2/14! Here is the latest promo picture. The twin unit AMIAYA who are active as fashion icons representing TOKYO produced the album's visual aspects! Here's a description about the album posted on CD Japan. The T-Shirt Edition will feature a t-shirt designed by AMIAYA; the DVD Edition will feature a DVD (Region 2) with their MTV 「Storytellers」 performance on it. An album that expresses a sweet & bitter yet glamorous band groove has been completed! 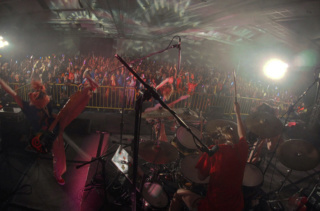 With songs like the now-classic live song 「Take Me Out」 that was written as a festival song for the band's 10th anniversary, and the iTunes chart-topping digital single 「Koisuru Universe」, all songs feature lyrics and music written by the members. 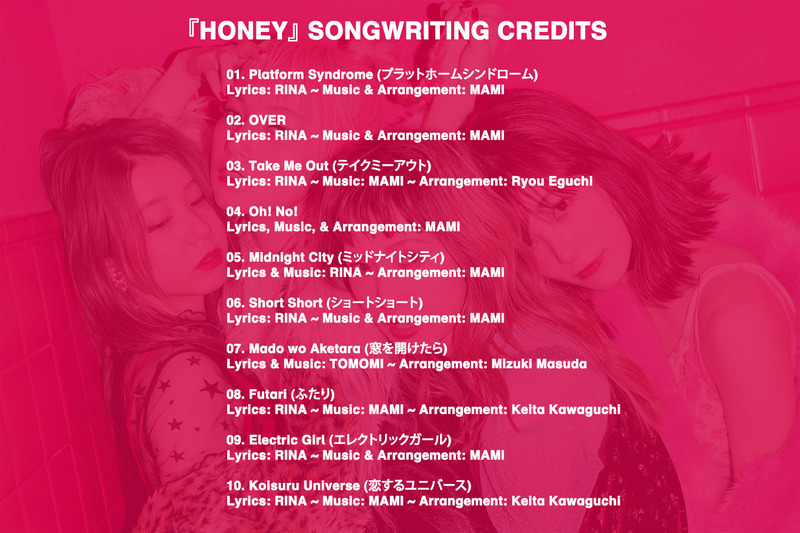 It includes others such as 「Platform Syndrome」, a song that incorporates a solid, modern sound filled with speed, as well as a large number of songs with love themes such as impulses and exhilarations of love; and sentimental, painful stories. Their eighth original album is packed with things only they can express due to being an all-girl band that possesses glamour and sweetness. The artwork was made in collaboration with AMIAYA, fashion icons who represent TOKYO. The DVD Edition will include a recording of MTV 「Storytellers」 held at Billboard Live Osaka on 2017/8/21 to celebrate their 11th anniversary. A bonus item (TBA) is also be enclosed. The T-Shirt Edition comes with a t-shirt designed by AMIAYA. A bonus item (TBA) is also be enclosed. Woo hoo!!! Can't wait to hear some new songs. I hope Rina's hint that they were going to be a little more rocking on this one is true. OH WOW, Valentines day? another fave band of mine is releasing their album on that day too. Oh boy I can't wait, maybe we get a listen to one of the new songs on Christmas eve like they did with Suki Suki in 2015. I'm liking the visual so far, maybe they are going for the mature scandalous love rock or something. On the CDjapan websit, i believe the passage that starts with Sweet&Bitter is the description of album, all i got from good ol GGtranslate is that its mostly love themed. Hmm. I sure would like to have the Tshirt, but I also want the DVD. Why can't the DVD and the shirt be together in one package? Do you think it would be availabe at the store? I mean the limited edition of Valentines Day? Or would it sell out even before the release date? Osakashnaide wrote: Hmm. I sure would like to have the Tshirt, but I also want the DVD. Why can't the DVD and the shirt be together in one package? Simple: to get more sales. That's just how it is. Yes, they will be available at CD stores. They're not going to sell out of copies before it's officially out. All editions will be available at CD stores starting from the 13th, the day before the official release (called flying get), so starting from that day you will be able to just walk in to a store and purchase a copy. Better go early just in case, though! You can also pre-order by calling a store, or going there before it's out and reserving it. Thanks for the information. Then I guess it's okay to just wait for it at the CD store. They're not gonna sell out that fast right? 14 is Wednesday, and if there's no change in schedule the soonest I could go would be Sunday which is 18th of February. It'd be frustrating if I go there and find out there's only the regular cd and no t shirt and DVD. Osakashnaide wrote: Thanks for the information. Then I guess it's okay to just wait for it at the CD store. They're not gonna sell out that fast right? 14 is Wednesday, and if there's no change in schedule the soonest I could go would be Sunday which is 18th of February. It'd be frustrating if I go there and find out there's only the regular cd and no t shirt and DVD. Sunday might be too late. In your case, I would really recommend going to the store ahead of time and pre-ordering your copy, if possible. At least that way you'd be securing a copy and you wouldn't have to worry about it selling out. That'd mean I would have to use what little Nihongo I have in my arsenal, lol. I guess I'll just have to pre-order it then via the link above. Anyways, when can we see how the shirt looks like? Is there already an image out? Oh, by the way, if I purchase both the DVD and T-shirt edition, then I would have 2 cd which I don't think I would need since I'll be listening from Spotify and not the actual CD itself. Although I would need one for my collection, I think I'll be giving the other one to a member here. Hmm, pre-order now all in one place; or wait and see if there are different bonuses for different stores? Also, hopefully this info is correct, but it looks like one of the new songs is called "Platform Syndrome"! Osakashnaide wrote: That'd mean I would have to use what little Nihongo I have in my arsenal, lol. I guess I'll just have to pre-order it then via the link above. Anyways, when can we see how the shirt looks like? Is there already an image out? You could also try reserving online and picking up in store. I know Tower Records will let you do that; not sure about other stores, though. The shirt design will be released at a later date. I'm guessing after BEST Xmas. The covers and tracklisting will probably also be posted then. joon wrote: Hmm, pre-order now all in one place; or wait and see if there are different bonuses for different stores? I think by now we can definitely assume that, yes, there will be different bonuses for different stores. It's always a good idea to order at least one copy from a store like CD Japan, though, as they most likely will be offering a poster. a perfect st valentine's day gift ahah. visual looks on point, it's like looking at a fashion editorial and with the collaboration with AMIAYA and the album's title, it all just fits perfectly in my opinion. the description of the album's sound and lyrics also looks really promising. I'm not sure where's Tower Records in here though. Say, just this month, I've already bought Hello World (comes with a DVD) and 3 of their live DVDs and as I don't have that much money in my pocket already, I am planning to get back to the store at the end of this month (after I get my salary) to buy other CD and DVD of them that I still don't have. If I ask them to save me a copy of Honey come Feb. 14th, would I already be asked for a payment? Or I can pay it when I come and get it later? Osakashnaide wrote: If I ask them to save me a copy of Honey come Feb. 14th, would I already be asked for a payment? Or I can pay it when I come and get it later? Honestly, I have no idea, but I imagine you would be able to hold off paying until you pick it up. I was thinking that that'd be the case. I know it's off topic but I noticed just now, that's you on your signature, right? thoseguiltyeyes wrote: I think by now we can definitely assume that, yes, there will be different bonuses for different stores. Any idea of when bonuses are usually announced? Usually I just order everything from CDJapan. But it's kind of boring to end up with 3 ad posters. Wow great news, thanks for the info Jade and I love the pictures too. I've been wondering to what their next album name will be like and I'm happy with "Honey". It gives a more marute, girlish, sweet feeling and the fact that it will be released on Valentine's day makes it more sweet. Ahh.. can't wait to hear 'Platform Syndrome' and all their other new songs. I'm sure this album will be so awesome because it includes two of my most favorite songs from them. Scandal sure improves a lot and they continue to live up to their name. The first time in your life? Must be young. I saw this on the "Line" app - so cool. Added a copy w/ T-shirt to my cdjapan order already set up. It's pretty cool this will be released before their tour. CDJapan says the t-shirt copy is extremely limited and limiting to one person per order. As for Valentines day - I've been married over 15 years, and my wife hates Valentines day - so it's pretty much a non-event for us. Cool, I can't wait to hear the new songs. I'm thinking about getting the t-shirt edition for the first time. I'll wait with the preorder until they publish the design of the t-shirt. What size do the t-shirts usually have? That's great news, less than two months, I can't wait! I'm sure it'll be great if we consider all the songs they've made since Yellow. I'm not sure about that main image though, I love their looks but the treatment/lightning of their faces looks a bit 'plasticky'. Hopefully that won't be the case for the album cover.